HAPPY FIRST DAY OF FALL!!!! I hope you’ve had a wonderful Friday full of pumpkin spice and everything nice ;) I’ve got a homemade pizza in the oven, a pumpkin spice candle lit, and sweatpants on. Cozy fall Friday for the win. Maternity clothes? 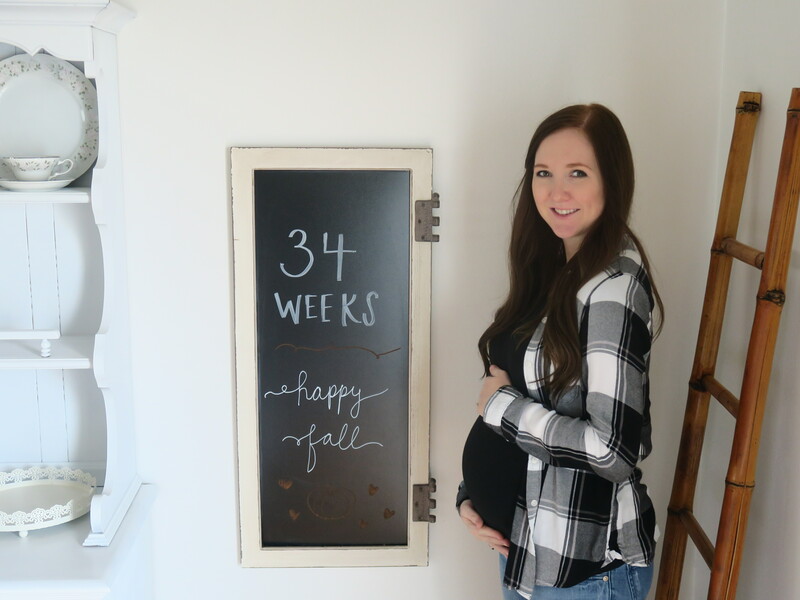 Mixing and matching maternity and regular still! Just the jeans I’m wearing in the above picture are maternity. The shirt is just really stretchy and the flannel is sized up to a medium. Sleep: This week was a little rougher in the sleep department, although I still have no problems falling asleep. But what’s a girl to do when she wakes up hungry at 3 am besides climb out of bed and eat a peanut butter pumpkin cookie?? Best moments this week: Officially welcoming FALL today!!! Baby girl season! Movement: So much movement! And lots of hiccups. Poor thing – I hate getting the hiccups! Food cravings: Loving pumpkin and peanut butter these days. I even combined the two in a delicious (healthy) cookie recipe. Anything making you queasy or sick: Not a thing. Have you started to show yet: Yep – rocking quite the pumpkin. Labor Signs: Kinda? I forgot to mention that at my last appointment I learned what a Braxton Hicks contraction is! Sometimes baby girl will be a giant bulge in one side of my stomach, and when my midwife was measuring me it happened and she explained that it was a BH contraction! I had no idea, since when it happens it’s not painful at all – it just looks kinda funny. I guess my body is practicing contracting. SO CRAZY. Weekly Wisdom: My office ordered me a standing desk option and it’s been really great. I sit for most the day, but once my back starts to hurt I raise the monitors and keyboard so I can stand. It totally helps my back pain throughout the day so far. Looking Forward to: Spending time with friends and family at my baby showers the next two weekends! !